What is the Client Relationship feed? As a business owner, building and improving relationships with your Clients helps you grow your business. 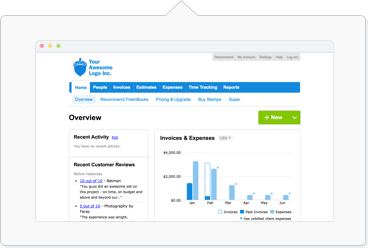 FreshBooks makes it easy to manage these relationships by providing you with a historical timeline of all interactions with your Client inside FreshBooks. You're also able to leave internal notes for each Client that only you and your team can see. Internal Notes are a great way to keep track of your Client details by recording private notes. This is only visible to you and your team. Under Relationship, click on the area where it says Add notes here (they will not be visible to your client) and begin typing. When you're done, click away and the text will be saved. The Relationship Feed is a valuable tool for helping you stay on top of your Clients' activities by seeing their recent Invoices, payments and more. Having a feed also allows you to keep an eye on your Clients' activity with the goal of helping improve your business relationship with your Clients. Click on any event in the Relationship and you'll be taken to that particular event. For example, if you click on an Invoice inside the Relationship, you'll be taken to that Invoice.